Great mouse and Keyboard. Good reviews on Ebuyer too. There is also TCB & Quidco available to make it a little cheaper. 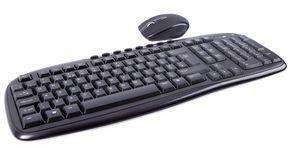 Mouse & Keyboard itself is £8.99 but for the cheapest delivery it comes to £13.18 - Still cheaper than anywhere else. Elsewhere it is £16+. There are different delivery types available as long as you are willing to pay a little more. This is a brilliant product, very pleasantly surprised. Lots of expensive keyboards/mouses out there so wasn't sure what I would be getting with this. Mainly bought for PS3 but wanted to use it with laptop too. Instant plug and play, plugged USB mini dongle into PS3 and Keyboard & Mouse worked instantly, no pairing etc required. Fully funtional with all keys as per normal keyboard, Funtion keys work in PS3 browser e.g. F1 brings up options, F3 Favourites, F4 Address input, F5 refresh, Windows Button goes to X-Bar thingy. Mouse works a treat too. Tried on laptop too and worked perfeect, as soon as USB was plugged in. Hoping for low battery usage, not sure yet obviously, 2xAAA in each Keyboard & Mouse. Arrived on time as suggested by Ebuyer. Very nice keyboard quiet and soft touch. Compact design for a standard keyboard. Battery life indicator light should be useful. Mouse may take a while to get used to as the scroll wheel needs slight pressure to operate. But if depressed hard a switch operates with the option of scrolling up and down smoothly. There is an on/off switch at the bottom of the mouse which should save battery life, if you remember to use it. Quite pleased with the purchase. This is a great product. Needed a new wireless keyboard and mouse combo to replace my Microsoft setup which is becoming less responsive after 3 years. Love the mini dongle which is a great improvement over the receiver of the Microsoft one which had to be placed on a non-metallic surface and took up some desk space. Keyboard and mouse are responsive and works like it should. The mouse is a bit light and does not have the quality feel of the Microsoft but it's accurate and works from 8 ft away which is fine by me. Another great thing about this product is that it really is plug n play, as mentioned by another reviewer, so no faffing about with software or drivers. It's so good, I've ordered another 1 for my 2nd pc. Even better now that ebuyer has lowered the price. Highly recommended. Get 1 before they're all gone. Was ordering from here anyway, so even hotter for me! Thanks for post looks cracking deal. saw this yesterday after a mate received his order, was surprised by the quality, mouse & keyboard great build quality, good keys, and the dongle is tiny. ordered, have some heat. Good deal but not if you live in N.Ireland, a tenner for delivery!